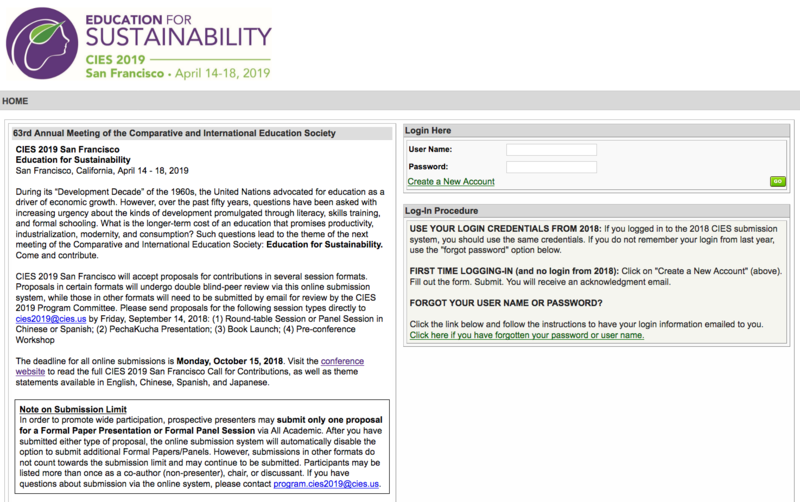 CIES 2019 San Francisco: Proposal Submission System is Now Open! We are pleased to invite you to submit a proposal for CIES 2019 San Francisco, the 63rd Annual Conference of the Comparative and International Education Society (CIES). The event will take place in San Francisco, California, from April 14-18, 2019. 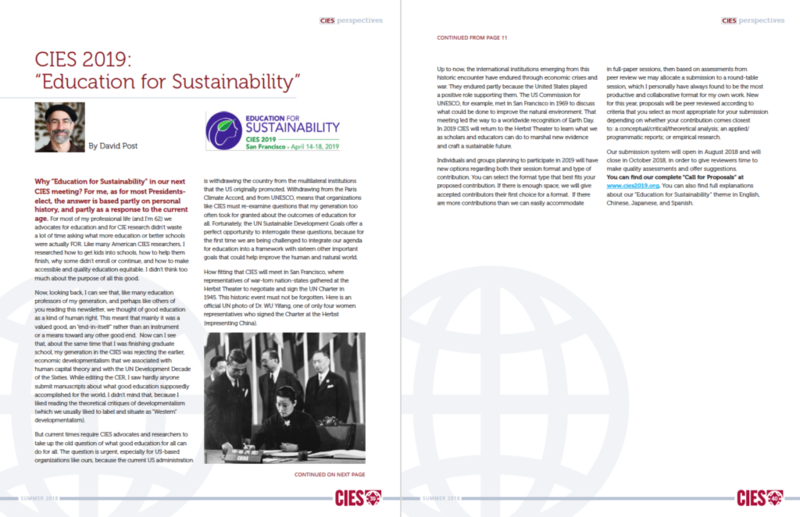 The theme of the conference is “Education for Sustainability.” Explore www.cies2019.org for more information about the conference, including the full Call for Contributions. If you submitted a proposal to and/or attended last year's CIES conference, you will have an existing All Academic account. To log in to the online submission system, you should use the same credentials. If you forgot your username or password, simply click on the “Forgot your user name or password?” link to retrieve your account information—rather than creating a new account. If you are new to CIES, please establish a new user account. Four other kinds of contributions should be emailed directly to the CIES 2019 Program Committee, which will make decisions based on quality and available space. Please note that these kinds of proposals will be reviewed on a rolling basis and have an earlier submission deadline of Friday, September 14, 2018. 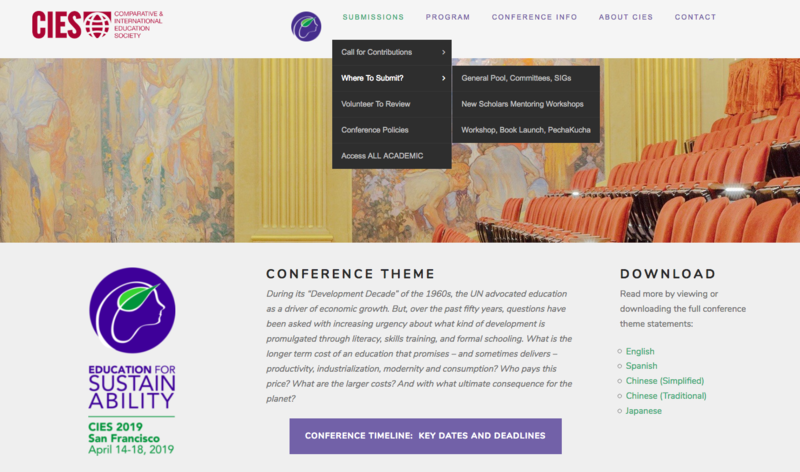 The CIES 2019 San Francisco conference website has been revamped! From conference policies to details about the venue, our website is easy to navigate and has all the resources you need. Where to Submit Your Proposal? Be sure to bookmark cies2019.org for all the latest conference updates! 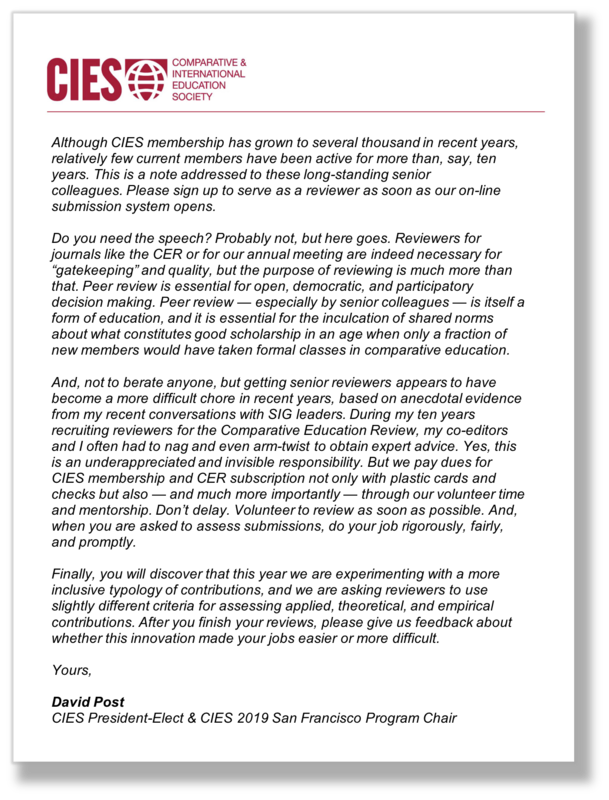 Click on the image below to read awelcome letterfrom Professor David Post, CIES President-Elect and Program Chair for CIES 2019 San Francisco. CIES relies on its members to evaluate all of the paper, panel, round-table, and poster proposals that are submitted to our annual conference. We seek scholars in the field of comparative and international education with a wide range of specializations and areas of expertise to review for the General Pool, Standing Committees, and Special Interest Groups (SIGs). We need volunteers at all levels — whether academics, practitioners, or policymakers — who have at least some experience attending CIES conferences. The intellectual rigor and strength of reputation of our annual conference derives in part from our blind peer review process. To volunteer to become a reviewer, please log onto our online submission system, All Academic, and select “Volunteer to become a Chair, Discussant, or Reviewer.” For additional details about the double-blind peer review process, please visit our conference website here.